In a presidential campaign where fantasy and reality are constantly clashing, the memeification of Bernie Sanders is a strange phenomenon. The fervent need to declare Sanders the most authentic presidential candidate falls somewhere between hysteria and deification. But now the Sanders phenomenon has reached a climactic moment. Sanders statistically probably won’t be the Democratic nominee but his perceived authenticity is still attracting rabid support. Birdie Sanders, the meme that emerged after a bird landed on the podium as Sanders gave a speech in Portland, illustrates the spectacle surrounding his candidacy. The audience reaction, seen above, is mesmerizing. It is unreal. It is literally the unabashed fandom reserved for Tumblr manifesting itself at a political rally. It’s also reminiscent of a trope commonly found in several Disney Princess movies. I’m not sure what dream they conquered. 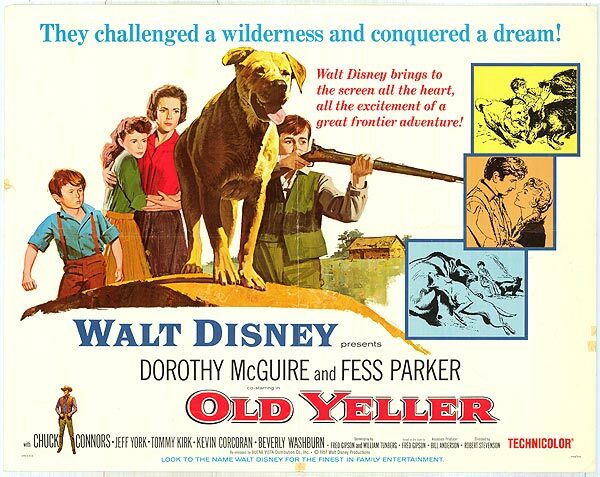 Because what happens in Old Yeller is definitely not the American Dream. I shouldn’t make fun of a beloved family film. I really shouldn’t. But I will. Because although Old Yeller is enjoyable and will make you cry buckets, it is also ridiculous. The latest adaptation of A.A. Milne’s Winnie the Pooh hits theaters July 15. The timeless animated feature is very much a throwback to earlier versions of the Hundred Acre Woods and its lovable inhabitants. There are also some unique touches. Disney released a clip yesterday of Zooey Deschanel singing “So Long,” a new track that will end the movie. Watch it below and be prepared to smile. I am in no way the intended demographic for Winnie the Pooh, but this short feature makes me so excited for this movie. Who’s with me? Disney has adopted one promotional strategy for all of its current and upcoming releases: nostalgia. We saw it used in the trailer for 2011’s Winnie the Pooh. Here it is again in the latest trailer for Tangled, released this weekend. Tangled is Disney’s 50th animated theatrical feature and this trailer celebrates that by featuring clips from every previous Disney film. Paired with “Dreams,” a Brandi Carlile song, and you have a nostalgia-filled trailer. BFI Southbank will screen the Disney 50 and will host a variety of events with Disney artists throughout 2011. Released yesterday, the trailer for Disney’s 2011 adaptation of Winnie the Pooh is awesome. There are so many wonderful things going on in this trailer, it is overwhelming. The simple character introductions of Pooh, Owl, Eeyore, and Tigger! The 2D animation! The reminder that Winnie the Pooh was a book first! The use of Keane’s “Somewhere Only We Know”! It is a clever marketing ploy on the part of Disney to evoke nostalgia among those older filmgoers, like myself, who grew up on the original 1977 Winnie the Pooh movie. The recent Winnie the Pooh movies that used new animation techniques and focused on Tigger and Piglet were poorly received. This upcoming adaptation revolves mostly around Pooh and the whole Hundred Acres Wood gang. It is such a great move on the part of the creative team (which includes exceutive producer John Lasseter) to return Winnie the Pooh to its original form. After all, Winnie the Pooh is a simple yet deep children’s story with such a lasting legacy and dedicated following (somewhere in my house is an original A.A. Milne book, courtesy of my grandmother, that I used to read as a child) that only the simplest form of animation suits it.